waterside contemporary is pleased to present At the End of the Line, an exhibition bringing together four artists whose work draws out abstract lines. Using painting, drawing, sculpture and video, and setting off from geometrical formulae, conglomerates of everyday objects, found imagery and architectural forms, the artists extend our field of vision beyond the conventional horizon. George Barber’s Automotive Action Painting reveals the process of artistic mark-making, but places the gesture in a foreign and motiveless context. Spilling paint, Barber uses a series of cars passing on a tarmac road to create the traces, each set of wheels extends – but also muddles – the lines created by its predecessor. The resulting composition is an abstract expressionist joke, expanding the action painting of Pollock into a landscape scale. Lilah Folwer’s sculptures are at once minimal objects, and richly descriptive spatial forms. Working in mirrored and painted steel, fabric, polythene and paper, the artist creates geometrical forms that grown into topographies and landmarks. The shapes in Fowler’s sculptures reveal more the more they are studied, and in relating to other works – and the viewer – create new phenomenological perspectives. Karim Noureldin’s Evo drawings resemble architectural blueprints or plans for fantastical sculptures. The expanding series of works is a reservoir of shapes and colours, which the artist assembles in expansive configurations. The variety of scales present in Noureldin’s works – from A4 paper to facades of buildings - is an indication of their source and application. In the gallery, the abstract geometries draw in as well as into the distance. 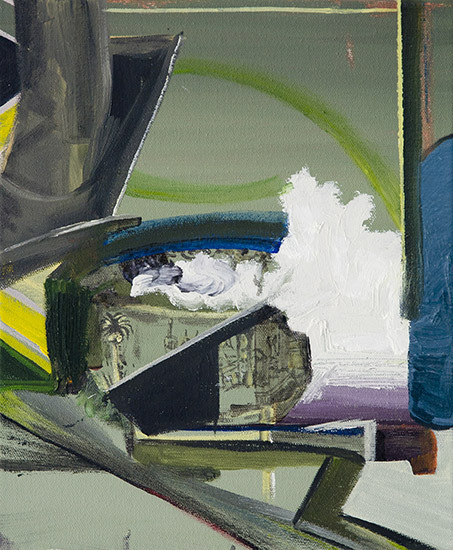 Helen A Pritchard’s abstract paintings refer to fantastical worlds the artist creates from objects on her studio table-top, or forms she finds in catalogues of antique jewellery auctions. The method the artists uses is familiar, recalling ideas set out by Modernism, but through drawing on the already abstract and semi-possible, Pritchard creates entirely new formations and possibilities. Each of the works in the exhibition defines its own position and describes a direction. Through extending into and past the abstract, the artists are able to lead the viewer into the yet-unknown at the end of the line. Launching in early December and co-inciding with the exhibition, Karim Noureldin will create a permanent public work on the roller shutter of the gallery’s shopfront. Nourldin has created many architectural interventions in Switzerland and the UK, including a semi-permanent work in waterside contemporary’s former gallery space in Wharf Rd. The exhibition is supported by the National Lottery through Arts Council England. The exhibition is supported by the National Lottery through Arts Council England. George Barber's Automotive Action Painting originally commissioned by Film and Video Umbrella as part of Single Shot. Funded by Arts Council England and the UK Film Council’s New Cinema Fund.